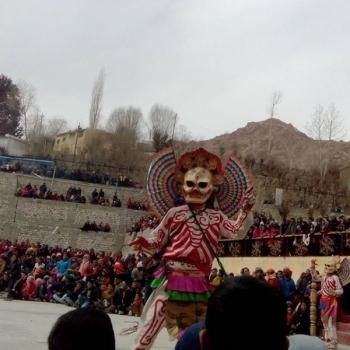 The best way to feel the Ladakhi culture is to witness its vibrant festivals.They are celebrated as an occasion to demonstrate the cultural heritage as well as the wealth of that particular monastery. It is also a merry-making occasion which provides people with various opportunities to interact with each other, form new ties and renew the old ones. Festivals are celebrated on fixed time periods, many of which takes place in winter- a relatively idle time for the majority of the people. 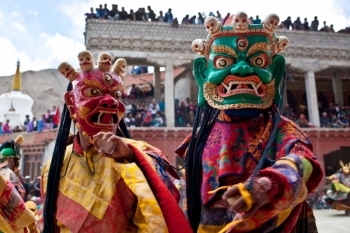 The core event of the monastic festival is Chams (mask dance) ( a highly choreographed sacred dance-drama) performed by monks, to the accompaniment of mystic tunes played on Monastic orchestra.Lamas robed in colorful garments and wearing masks perform mimics representing various aspect of religion. The masks worn by dancers represent the Guardians, Protectors, Oracle and the Gods and Goddesses. huge crowd gather to heighten the sense of the occasion. 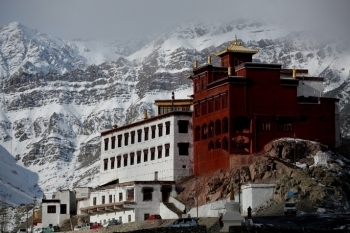 Ladakh local travel company Lynx Expeditions organic trip to every festival in Ladakh and Himalaya.